« 126 - British? Me? Apparently not. 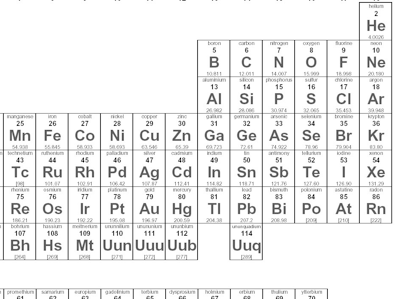 The recently discovered element Zombium, Zo¹, is to be placed in the Periodic Table below Radon. It has a filled T shell. Its precise positioning is under discussion dependent upon seasonal time-based testing, generally producing results in August. The picture to the right shows where Zo may be added, low on the right. Zombium has nine full electron shells²; because of this it is largely un-reactive. A non-metallic element, at normal temperatures it is a solid lump; it is curiously unreflective, even dull, but under ultra-violet and the flickering light such as emitted by television screens it phosphoresces. Under electrical stimulus its response is similar to that of a semiconductor to but it continues to be fundamentally resistive. The chemistry of zombium becomes interesting when the material is placed within mild electrical and magnetic fields as its reactivity increases significantly. This a cause for further study; one idea is that the outer shell is sufficiently far from the nucleus to be affected by local field strength. Recent tests have shown curious changes in behaviour when in the presence of alcohol, where there is a brief effervescence followed by aggressive fulmination during which the surface breaks down. Zombium has at least two isotopic forms, characterised as XY and YY. The general characteristics are that XY reacts aggressively and YY more passively, though that is not so when in intimate contact with precious metals. The YY form has a strange reaction to diamond but not graphite, running counter to the usual concept of increasing surface area lowering the activation energy. This suggests a limited range of catalysts in zombium chemistry. It is thought that Zombium will form flourides, of the general formula ZoF2n, in the same form as Xenon does. This has not yet been established experimentally. There are three possible cubic crystal structures available to Zombium: simple cubic; body-centre cubic; and face-centred cubic structures. Zombium can move between these structural types on the application of pressure and with a change in mass: the larger the mass of Zombium the less likely that the simple structure is to be found, with the element increasingly tending towards body- and face-centred structures. Separate research in Qingdao China has produced a draft research paper that describes one allotrope of Zombium as a ‘complicate’³, a large formation similar to the buckyballs of carbon. This has generated new interest in heavy ‘molecule’ chemistry and the limited funding available has shown that, while some reactions will output light, the complicates can output sound. The complicate structure combines many Zombium atoms in an alternating state, which flips between these states in response to a burst of sound. When a suitable stimulus is projected at the primary form, it changes state to briefly to the secondary allotrope and then collapses back to the primary rest state⁴. Hopefully some liaison between Bristol and Qingdao will connect these two sets of discoveries. Zombium has been tested for its semiconductor properties. It is extremely easy to dope Zombium, but, strangely, conductive performance decreases alarmingly with increased doping. Instead, gating Zombium, with the subsequent loss of electrons, improves conductivity. This improvement is temperature dependent, however, and even moderate temperatures lead to a loss of performance⁵. The parallel research in China does not disagree with this but points to there being some counter-acting effects with regard to the temperature dependency. Tests are as yet inconclusive but it looks as though the choice of doping agent leads to a different value temperature for optimum conductivity. Nanoparticles of Zombium have been found to exhibit liquid crystal behaviour. Under flow conditions they form nematic phases (no positional order, but long range directional self-ordering with long axes roughly parallel). In non-flow situations, pressure results in a flip to the ordered smectic phase, increasing pressure pushes the system back to the disordered nematic state. The Chinese researchers said they had looked at this ages ago. I found nothing written and they could not find their notes; I think they were having a face problem. The lead scientist is called Zhu Lian, which may be sufficient explanation. Catalytic properties are present for some organic molecules such as caffeine (to produce paraxanthine, theobromine & theophylline) and ethanol (to produce acetyl CoA). This is confirmed in China⁶. There is a lot of funding available for research into finding ‘more effective’ catalysts, where this term means in truth that the considered industrial manufacture reaction will cost less to operate. The researchers pointed to two approaches; use of Zombium as a catalyst, which looks at the moment to be an expensive proposition; use of catalysts to generate Zombium looks a far more worthwhile field in the short term. I will continue to comb research papers and will add to this if useful content appears. 1 There has been a suggestion that changing Zo to Zoo would cause the atomic number 200 to be remembered more easily [Zoo/200]. The counter-argument is that the name would then be Zoombium; one faction says that Zoo should be reserved for zoosis, a parasitic disease stimulated by the presence of Zombium. Those in favour of Zoo say, unexpectedly, that this is precisely why the name should be lengthened. The committee is adjourned. Following a more recent meeting, the argument for Zoo is retracted. At the time the atomic number was thought to be 200 but a review of the modelling showed that either Zombium has full electron shells OR it has atomic number 200, but not both. It is the number which has been retracted. Start from formula Emax = 4r+2 summed from r=0 to n.
So Zombium is 50 more,168, or 218, 50 more again. The recount continues. 2 So has Hell. It amuses me that the outer circle of hell includes adulterers but fraudsters are in the eighth circle. I await a classically trained chemist to find structural equivalence. Equi-valence, hah. 3 That’s complicate as noun, not verb. 4 One researcher we interviewed, excited by the opportunities, was predicting dramatic improvements in hearing aids, by using this facility to convey sound past an obstruction. Researchers have suggested this emitted sound be called a ‘grunt’. Inevitably, the initiating sound is called an ‘hello’. Mynah birds behave similarly, where the initial trigger is ge4 dai2. 5 On re-reading the original text I discovered I have quoted the executive summary. Moderate temperatures at which the decay occurs mean that values are found within the planetary climate range, say around 300 K. The researchers say this can lead to a loss of performance, as they cannot explain this; it is empirical evidence, i.e. based entirely upon based on the observations to date. 6 There are concerns that the research into this new material has resulted in contamination of the water supply. There may have been a tank-flushing accident akin to the Camelford disaster in Britain in 1986. Concerns are that the outbreak of immobility in late teenagers in March and April is connected to the suspected accidental spillage. Of course, in Qingdao, it is observed that if the water is contaminated, it is likely that the beer has a similar problem; we do not know if the filtration plants that the beverage manufacturers use (TsingTao beer and Coca-Cola both have plants here) will be eliminating particles of this size. My resident Qingdaoan chemist (capital of Nevada) bought the whole thing (wholesale, indeed) and has gone home wondering how I did so much of the research within the school premises. With my electronic screwdriver, obviously. Thanks to Dr. P.G. Dunton in Bristol for a considerable contribution. Thanks to the widely read Jess Farr-Cox for insights received in early April gleaned from as yet unpublished theses. I’m hoping that the University of Plymouth [CJS] and the University of Manchester [SJW] will have some insights to include in time for a timely reprint in another year. To anyone else discovering useful content, please write and I’ll try to add it. The chaplaincy at Sarum pointed that this is similar to the references to Administratium, which discovery was awarded an igNobel Prize in 1991. Also Bureaucratium which is special for having a negative half-life. Unobtanium, also known as handwavium,…. buzzwordium, impossibrium, hardtofindium, phlebotinum; Wishalloy (eventually found) and others are also reported. Wikipedia does not yet report on Zombium.